these are never a deal to me because you have to pay postage and you can only order one. 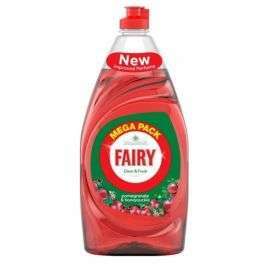 This is Fairy Clean & Fresh, not Original. C&F is very thin and lasts …This is Fairy Clean & Fresh, not Original. C&F is very thin and lasts nowhere near as long as original. This is Fairy Clean & Fresh, not Original. C&F is very thin and lasts nowhere near as long as original. According to the link it's 2 for £1.00. Also only available to members. Agree....original lasts so much longer. I purchased the humongous bottles of the clean and fresh as it was on offer thinking all fairy liquid is the same quality... but I find myself going through this pomegranate one so quick it’s ridiculous! these are never a deal to me because you have to pay postage and you can …these are never a deal to me because you have to pay postage and you can only order one.